David Crosby was there in 1969, with supergroup Crosby, Stills, Nash & Young at Woodstock, when Arlo Guthrie roused the audience with his musical tale of bringing illegal pot into the United States. And back then, at what would become the defining event of a generation, he couldn’t imagine he’d ever see the day when marijuana would become legal. “I thought that we would continue to be marginalized,” Mr. Crosby, a rock legend and pot enthusiast, said in an interview. Welcome, then, to the end of prohibition in Canada with today’s legalization of recreational pot. And with it, a new industry that, as The Globe and Mail’s Mark Rendell put it, has captivated Canadian business. Compare 1969 to 2018. These days, a warrant is more likely to be an investment in what promises to be the lucrative legal market, and search is probably related more to looking for stock symbols. As for high yield, you could read that two ways. Mr. Crosby is a prime example of the change. Never having endorsed anything, he’s now trying to lend his name to one of the many companies hoping to win as recreational pot becomes big business. He believes in legalization, and the money can’t hurt. His business associate in the venture, Steven Sponder, said they’re “getting close to signing a licensing deal with a company that has a presence in Canada and the U.S.
My colleague Mark Rendell, one of the key players in our ongoing coverage of legal cannabis, noted that this new sector has captured the imagination of Corporate Canada over the past few years, to the extent that law firms, banks, securities dealers, consultants and brand marketers are all involved. Several businesses have sprung up, corporate deals are being done, stock analysts are analyzing, and consultants consulting on everything from entrepreneurship to workplace issues. Public relations people, in particular, are out in force, trying to get their executives or experts into print. It’s early days, too. Already we’re seeing link-ups between companies, and observers expect more as alcohol, beverage and tobacco groups figure out what’s in it for them. “This growing industry appears to be spawning a raft of start-up businesses keen to have a stake in what is likely to be a multibillion-dollar industry, but with that there still remains a high degree of resistance to its legalization on a wider scale,” CMC Markets chief analyst Michael Hewson said today, referring to global developments. And, as with any new industry, expect consolidation as the big swallow the small, meaning there’s money to be had on the investing side if you bet correctly. 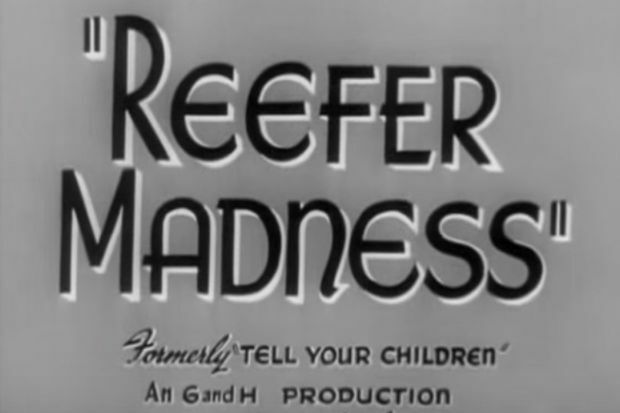 Here’s where Reefer Madness comes into it. In later years, the film became something of a classic because of how funny it all seemed to the youth of the 1970s. Some might indeed consider today’s market side of things as madness, as valuations run extremely high in what has been referred to as the pot-com era. A fascinating one, this, particularly for the folks at Statistics Canada, who have to account for an entirely new legal sector of the economy, and who can also now impress their friends by pulling out facts and figures on pot rather than rhyming off the ratio of household debt to disposable income. It’s going to make a difference to the size of Canada’s economy, too, albeit an artificial one. Toronto-Dominion Bank economists, for example, recently raised their forecast for economic growth in Canada to include both legal and illegal marijuana activity. TD projects that the legalization of pot will inflate the measure of gross domestic product by up to $8-billion, and will factor into the calculations primarily in this last quarter of 2018 and the first three months of 2019. As the TD economists see it, economic growth of about 2 per cent in the final quarter of this year would have been about 2 per cent, but factoring in the new marijuana industry brings it to 2.9 per cent. They also bumped up their projection for 2019 growth to 2.2 per cent. But it’s not really real because, among other things, marijuana was already being consumed, though not officially measured. Yes, there could be an impact on housing prices, according to the real estate industry. Realtors have been on something of a campaign against home cultivation. Like, you know, there’s mould and stuff. And homes are big investments, not like university dorms. Organizations across the country are coming to grips with it all, and some of them are struggling to do so. “Not only is legalization of cannabis going to demand a change to all workplace policies, but, at Mercer, we anticipate a ripple effect when it comes to health care benefits for medical marijuana,” Mercer said in a recent study. “Upon legalization, it’s expected that more may consider it for medical uses, such as pain or nausea management,” the consulting group added. Its survey was a while ago, in May, but it showed that just one-third of employers felt ready for legalization, but many were “taking a ‘wait and see’ approach." Mercer advised employers to go over their benefits programs, whether they take in medical cannabis under disability provisions, and whether they need to do more. Its other recommendations included drawing up policies. For example, where will pot be allowed if an employer allows it on site. Also recommended was preparation for “social change.” As in, will pot be allowed at events hosted by the employer? Ian Brown: Can marijuana save this Ontario town? Toronto pays highest marijuana prices as costs spike in Ontario, fall in B.C. Konrad Yakabuski: Can Legault make the Québécois tiger roar?